These bonded rounds are perfect for concealed carry or home defense with your 9mm handgun or carbine. Winchester's Ranger Law Enforcement label represents a top tier brand of duty ammunition engineered for fantastic terminal performance. As such, each of these rounds propels a 147 grain jacketed hollow-point (JHP) projectile with a bonded construction which helps defeat glass, sheetrock, and dry wall with minor deflection; this is made possible by permanently welding the copper jacket to the bullet's lead core which prevents shedding and separation. During entry into a target, the heavyweight round will expand at a controlled rate and halt movement inside a vital area for optimal energy dump that translates to a quicker, more effective drop. Each bonded JHP projectile is secured into a reloadable brass casing which is fitted with a clean-igniting Boxer primer. The case and primer are both nickel-coated for seamless feeding, smooth cycling, and corrosion resistance in storage. This resistance also protects from moisture which can accumulate in a holster during carry and ruin the round's function. When fired, these rounds exhibit a dull red muzzle flash which causes very little night blindness for faster, accurate follow-up shots. Winchester's products are backed by over a century of original designs and long-standing caliber creation. They offer a wide range of products which offer inexpensive solutions to law enforcement personnel, hunters, and competitive shooters. 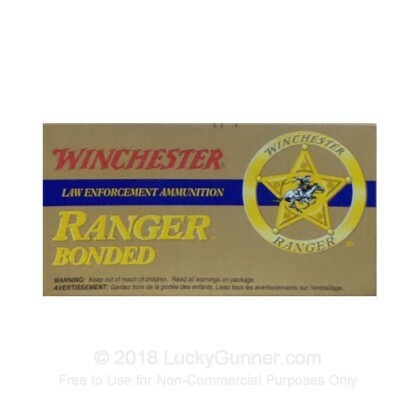 We don't have any reviews yet for this particular 9mm Luger (9x19) ammo from Winchester. 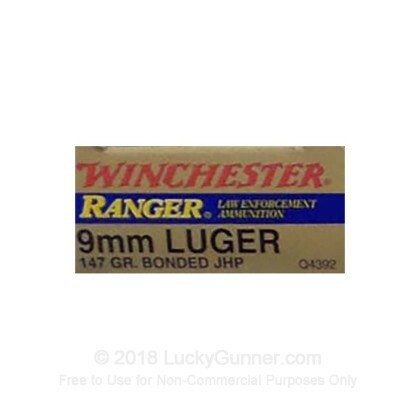 If you'd like to be the first to review this particular 9mm Luger (9x19) ammo from Winchester, fill out the form below.